Verbal and non-verbal communication are two essential elements to all human communities. Language, verbal communication, is an expression of our yearning to be understood by those around us, to be part of a society, a community. The love of the Hebrew language and the recognition of its importance in shaping the culture we live in are the starting point of this special exhibition, coming soon to Beit Hatfutsot museum’s new Family Gallery. 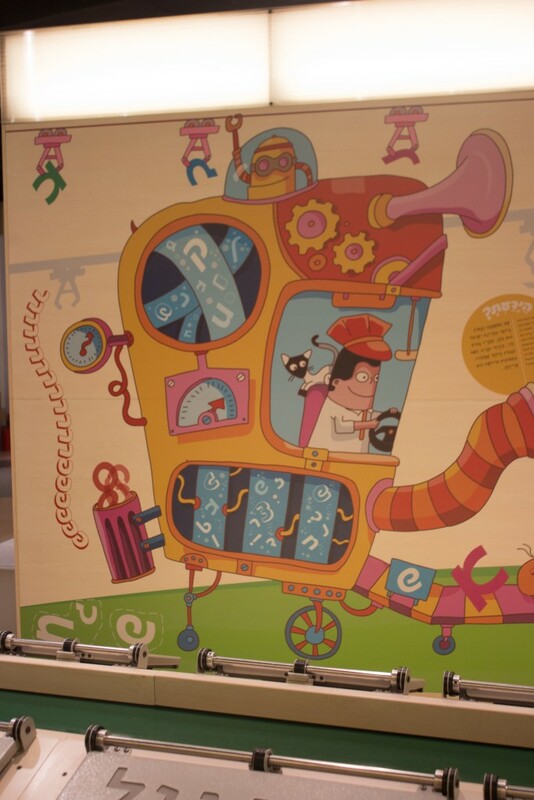 The exhibition aims to introduce both children and adults to the wondrous elements of language and communication in general, and of the Hebrew language in particular. The subjects chosen for the exhibition give the culture language evolves in its due, while highlighting language’s ability to innovate and reinvent itself, and recognizing its amazing power as the basis for the existence of a dialogue between human beings. Ah-Ba-Ga-Da broadens our understanding of the place of language in every-day, cultural contexts through play, discovery and exploration, and encourages families to have fun and learn together, engaging everyone from kindergarten and school children to adults. This is an unprecedented attempt to present Hebrew, and language in general, as an interactive experience and a part of the sense of play in life. It began with a desire to open Beit Hatfutsot up to new audiences that had never before passed through its doors. The concept of Beit Hatfutsot, as a museum, relies on an understanding of the background of the Jewish people and requires basic familiarity with the main elements of their history. All the museum’s exhibits assume that the visitor is capable of an informed reading of 2500 years of history. The main challenge we encountered was the need for at least some familiarity with this background in order to understand the exhibition, a prerequisite that prevented families with young children from visiting the museum and benefitting from what it had to offer. 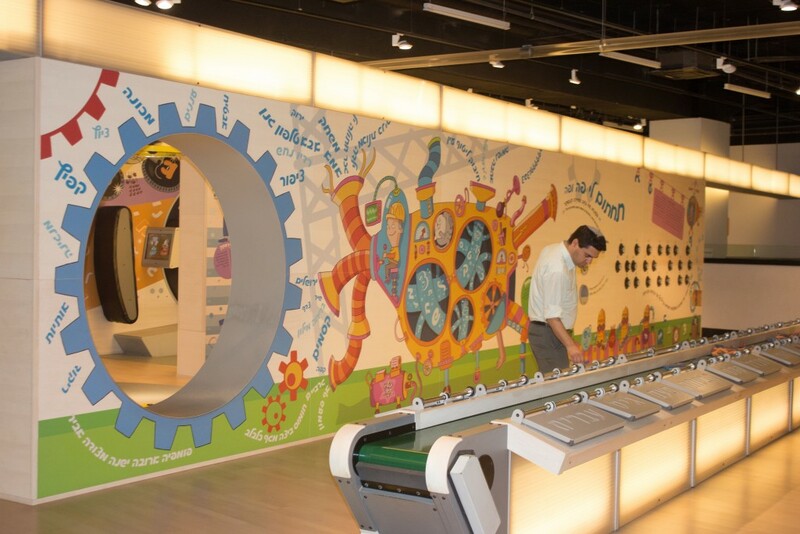 The new Family Gallery at Beit Hatfutsot allows even very young children to experience the exhibition alongside older family members, as they discover the verbal and non-verbal aspects of human communication. While some of the exhibits require the visitors to read and understand instructions in order to interact with them, others are more simple to operate and enjoy, and provide a basic learning experience, no literacy required. The Tower of Babel, for instance, is an exhibit that invites visitors to build a tower out of soft blocks with shapes and letters on them. Stacking blocks requires no reading skills, but the process of building the tower teaches many of the principles of combining signs and symbols, one of the bases of language, as well as the human need for cooperation between members of a community. Other games allow young people to discover the different forms of human communication, from Braille to pantomime. These and other exhibits demonstrate the playfulness of inventing new words using the principles of roots, putting words together into sentences and much more. All these exhibits are spread out across the gallery in a seemingly random fashion, encouraging a process of intuitive discovery and experimentation – the same process by which we learn language as children. Language is revealed as a continuous game of discovery and invention, where everyone can find the secrets they are most drawn to, while learning how they are woven into a tapestry of thoughts and actions, and finding organized and attractive means of expression. The discovery of language is the great game the children, as well as the adults accompanying them, are exposed to during their adventure in this linguistic environment. First published in “Panim Rabot” cultural magazine, no. 2, Beit Hatfutsot, 2011.